Why Choose Dare Britannia? - Dare Britannia, Ltd.
Why should you choose Dare Britannia, Ltd. for your Series Land Rover Restoration? Date Britannia, Ltd. is perhaps the oldest and most-experienced restorer of vintage Land-Rovers in North America. The owner of this company has been repairing, servicing, buying, selling, driving and restoring what are sometimes referred to as “Series Land-Rovers” since the late 1960s. Our inventory of spare parts virtually fills five buildings at our West Coast location alone. Our inventory of parts is warehoused on both coasts of the United States, while a considerable stock is also held in London, England. We are the indefatigable champions of restorations done with steadfast dedication to faithfulness, exacting precision and insistence on correctness and originality. Our “competitors” apparently are comfortable with using reproduction parts sourced from China, India and other countries with a track record for supplying parts of distinctly dubious caliber. We have, on rare occasion, purchased spare parts from a very few of our parts-supplier competitors, only to discover a litany of items poorly manufactured which don't fit, function sub-optimally, look wrong or are otherwise not of a caliber equal to the rigors of an exacting, top-quality restoration. In our restorations we insist on what we term “Birmingham Lucas”, or spare electrical components manufactured at the Joseph Lucas factory, back in the day, in Birmingham, England. The company, Joseph Lucas, Ltd., is now functionally inoperative but the name and manufacturing rights have been bought up by various manufacturers of dubious-quality reproduction parts. This offers a prime opportunity to clarify what I consider a longstanding myth: that Lucas parts are manufactured to a low build standard. While Lucas jokes have decades since been worn out, their quality, among the cognoscenti, is now keenly sought after as being the holy grail from a quality standpoint…..and with good reason. They stand shoulder to shoulder among the top-quality names in the automotive industry. Lucas equipment may not be flawless but neither is any other manufacturer. They are, in my professional opinion, right in there with the best. Our competitors describe hundreds upon hundreds of parts as “no-longer-available” which have been in our warehouse for decades, which parts we remain able to supply directly from our shelves for our in-house restorations. Even some of the British Land-Rover stalwarts, suppliers of spare parts “over there,” have come to us seeking the rarest of the rare. Let me offer an example of the parts we insist on: New Lucas distributors ceased being manufactured several years ago. Chinese knockoffs began flooding the market. Unfamiliar with the actual state of things, we ordered in a two sample batches of these knockoffs and put them to the test. Our suppliers claimed less than a 2% comeback rate, that their customers “just loved them!” We didn't. We don't simply install distributors, we test them on one of our distributor testing machines........and when we did, we were appalled. The situation is best illustrated by saying that after four hours of tweaking, cajoling, and modifying the very first distributor, our finest technician was barely able to make one of these Chinese knockoffs function……reasonably well. Not properly. Passably. That would call for approximately $375.00 of a fine technician's best efforts. We immediately sent the remainder of the distributors back to the warehouse and haven't considered buying another since. Today we insist on Genuine Lucas, and we test them right out of the box to be absolutely assured of optimal function. Not every one is perfect, and if they are found wanting we tune them until they function optimally. Our competitors seem to love aftermarket upholstery materials and products. We don't find a seat that lasts a few months (some not even that long!) acceptable. Instead we fit restored factory seats.......and follow them for years afterwards to be absolutely certain of their integrity. And they hold up for a very long time. When a restoration client's Land-Rover was built in the years from approximately 1958 through 1964 we restore their original seat cushions with original factory “Elephant hide” material. Not a knockoff. Not a copy. Not a reproduction. THE ORIGINAL FACTORY material........period. Our competitor's (aftermarket) door trim panels screw on. The factory items featured spring clips. Our door trim panels utilize original factory spring clips. Our competitors use knockoff Chinese master cylinders. We supply new-old stock (n.o.s.) Genuine Land-Rover, Genuine Girling, taken right from our own parts shelves. Consider steering boxes. We keep on ourselves n.o.s. genuine Land-Rover, original equipment Burman steering boxes and the inner column sets.... parts not offered by any other supplier in America. Our competitors use knock-off Chinese or East Indian water pumps. We supply new-old stock (n.o.s.) genuine Land-Rover water pumps taken right from our own parts shelves. If we don't stock a given part we make it. If we don't have the tools to make it we make the tools necessary to make it. We are very fortunate to have an in-house tool maker and fabricator. We remanufacture a great percentage of the parts we fit to our restorations.....which includes engines, gearboxes, differentials, distributors, carburetters, fuel, oil and water pumps, door latches, heaters, radiators, fuel tanks, and sheet metal. We manufacture and supply components never offered by the Land-Rover factory itself. Land-Rovers were never designed for speed, and rightfully so. A multi-purpose adjunct agricultural vehicle shouldn't be engineered for speed, but since working under the guidance of Doug Fraser at Doug Fraser Racing Engines (winner of approximately 10 national championship race engines) in 1974-75 I have been optimizing Land-Rover engine performance. Our Safari Four engines have seen service around America for decades. While not highly modified, these engines produce approximately 30% greater horsepower than the factory-specified engine. No engine is ever modified to the extent that it cannot be returned to the original factory specification. At the same time no client has ever expressed disappointment with a Safari Four engine rebuild. We are the winners of approximately 60 international restoration awards. The only restorations that beat our restorations at the shows are our own clients' vehicles restored by this shop. Half our restoration awards are first place. Or best of all Rover classes. One British Field Meet created a special award for our work, it was so exceptional. One of our client restorations was entered in three shows. It won four awards. The fourth was the coveted local Land-Rover Dealer's Best Rover on the Field prize. Virtually every one of our debuting restorations take first place. 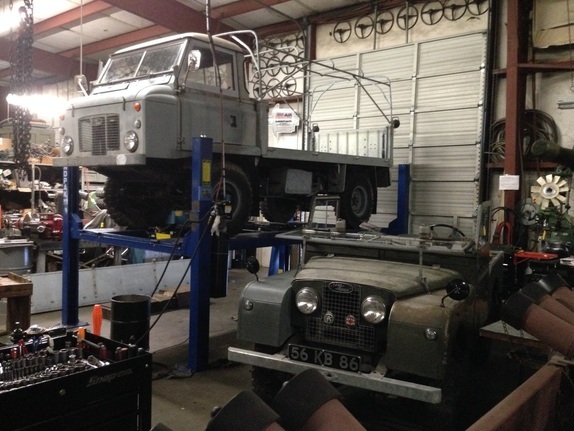 We were once called upon to look at a Land-Rover supplied by one of our East-Coast “competitors.” He claimed the ability to complete a total restoration in 16 weeks. Evidently he talked a good line. The new owner swallowed the bait but after owning his “restored” Land-Rover but a very few weeks he called in us to look matters over. When I read him our report, he immediately instructed me: “Sell it! !” Later on he changed his mind and softened his position. He directed us to correct the faults....so we replaced the engine, gearbox, the wiring harness, the heater, the radiator........ALL hydraulic cylinders except the brake master. That was Genuine. He purchased the “restored” Land-Rover for $16,000.00. Cost of correcting the faults: $23,000.00+. This example is but the tip of the iceberg........an archetype of the hordes of all-but identical examples from our history book. One of the men brought both of his Land-Rovers to my shop. That would be about $28,000.00 worth of iron. He put $35,000.00 in our bank account straightening out the majority of the mess. Not all. The majority. His penetrating conclusion: “I would have been better buying from you in the first place.” The trio of new owners tried to save money by buying from “the competition.” I'll let you draw your own conclusion. So appalling is the caliber of work that photographs of some of the parts have remained on the walls of my office for almost 20 years.